Portable Game Beats Console Games For... The First Time Ever? The selection of Scribblenauts as best game of E3 2009 by three major gaming outlets is a milestone for which we can find no precedent in gaming history. During the final day of E3 2009 I shared a quick cab ride with 5th Cell game designer Jeremiah Slaczka, and I asked him what was getting buzz on the show floor. Of course, he'd say that I chided. That's his game, the one that lets you write any kid-safe concrete noun into the DS and have it appear in virtual form to solve puzzles or just be played with. Maybe Slaczka was onto something, because Scribblenauts has been chosen as the Best of Show for E3 2009 not only by three of the biggest gaming outlets around — IGN, Gamespot and GameSpy — but it's done so without having to be a console or PC game. No handheld game has ever taken the E3 crown before from any major outlet, as far as we can tell. Look below to see the Best of Show winners from IGN, Gamespot, GameSpy, 1up and the E3 Game Critics Awards judges. Not once did these institutions pick a portable game as their Best In Show. They didn't do it for a Pokemon, a portable Zelda, a portable Grand Theft Auto, a WarioWare…. anything. Before E3, I had written that it was almost a sure thing that no portable game would take top honors. I was wrong. Should portable games have received a Best of E3 nod before? Were their console and PC counterparts just that much better? 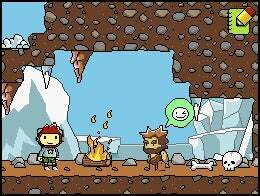 Scribblenauts is set for release later this year on the Nintendo DS. As of E3 2009, portable games have finally gotten better… or gotten respect… or both.